July is Dry Eye Awareness Month! The Sjögren’s Syndrome Foundation partners with various companies during July to help educate the public about dry eye symptoms, treatment options, and the possible cause being Sjögren’s. We hope you enjoy our July blogs aimed to promote dry eye awareness and education. 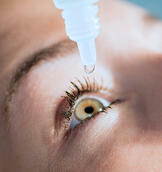 Q) Many eye drops claim to have disappearing preservatives. Are these the equal of preservative- free drops, or should they still be used like eye drops with standard preservatives? A) The development of “disappearing preservatives” has allowed eye drops to be formulated in multi-use dropper bottles for convenience without the risk of surface damage that can occur with the more potent and persistent preservatives. The mechanism by which such new preservatives “disappear” is usually due to chemical changes in the preservative that occur upon exposure to air or the tear film. The most common such chemical reaction is oxidation of the preservative, turning it into an inactive molecule. It must be remembered, nevertheless, that the inactive molecule can be something to which sensitive patients may react. It is worthwhile, therefore, that the patient be alert to any intolerance of such medication which can occur as irritation, discomfort or red eyes. The “disappearing preservative” eye drops can be used up to four times a day in most cases without difficulty and some patients can use them even more frequently than drops with regular preservatives. It should be remembered that other eye drops, particularly those used to treat glaucoma, can contain preservatives as well and, therefore, it is important for patients to keep track of how many drops are being instilled in the eye during the day. Truly preservative-free eye drops contain no such preservative chemicals but, therefore, require special packaging that limits the amount of the solution in the dropper to usually only one or two drops. The challenges of the smaller packaging can be a nuisance, but if the patient is sensitive to even the “disappearing preservative” this nuisance can be worth the better tolerance to the lubricant.